A range hood is both feature and function. It ventilates your kitchen from cooking odors, pulls moisture out of the air, and improves the air quality in your home, but it can also be the “wow” factor in your design. Combined with a stunning tile backdrop, you–and your guests–won’t be able to look away. 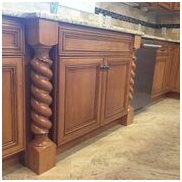 The cabinetry in your kitchen can run from sleek, rustic, modern, classic, or detailed, like these stylish pillars. Your cabinetry style and finish sets the tone, complimented by the countertop choices and flooring. 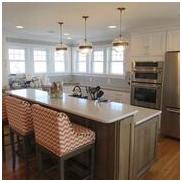 Often the focal point of a kitchen, the island serves a number of purposes. It can add considerable storage–whether closed drawers or open shelves to display china or cookbooks–serve as extra seating, a large and useful prep area, house your appliances and add an unmistakable design element. 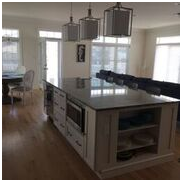 An oversized island is a great choice for entertaining. Which design suits your lifestyle? Your style is reflected through choices: cabinet style and finish, lighting, appliances, design of the space itself. 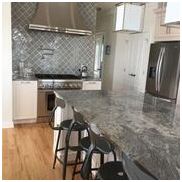 You’ll know how many people you’ll want to fit around the kitchen island, how large of an oven to handle the pans of lasagnas or trays of cookies, or how stunning of a range hood or backsplash to draw your company’s eye. And if you aren’t entirely sure, Garden State’s design team can help get you there by offering choices, asking questions, and finally helping you to determine: what is your wow factor? For more information on our design center in Lavallette, NJ, call (732) 854-1985. Or schedule an appointment with our design experts to plan your dream kitchen.